The Process of Building and Open Sourcing a Redux Component — The tale of a developer who built and released a grid component for React. A good read for anyone undertaking a similar journey. React Native at Instagram — React Native has come a long way since 2015. Instagram reflects on the successes and challenges some of its teams have had. Master These Five Concepts, Then Master React — You can boil everything you need to know about React down to five key concepts: Components, JSX, Props & State, the Component API and Component Types. 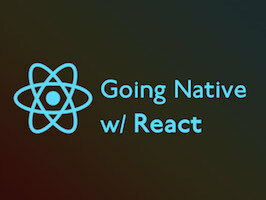 Going Native with React — Noted author Paul Hudson leverages your React skills to develop beautiful, powerful React Native apps. Twitter Mobile Traffic Now Powered by Node.js, Express and React — This week Twitter switched over its mobile traffic to a React & Redux PWA. Dissecting Twitter’s Redux Store — A developer looks at the organization of Twitter's Redux store given the recent changes (above). Image Caching in React Native — William Candillon shares formulas used in order to provide a smooth user experience when displaying images. How to Achieve Reusability with React Components — “True reusability is not an ad hoc process, but a development strategy.” Real world reusability insights from Walmart Labs. The Right Way to Test React Components — Stephen Scott shares a few patterns and tips that should work well when testing React components. React InstantSearch⚡ Lightning fast search for web and native apps — Algolia provides UI widgets and connectors (HOC) so you can build instant search in a few lines of code. Airbnb's React and JSX Style Guide — OK, it’s not new, but it continues to get fixes and tweaks. React Quickly: Working With States — Azat Mardan provides an overview of working with states in React. Offline First React Native + Meteor Apps — How to make your React Native + Meteor app offline capable. When to Define Action Creators in Redux — Why action creators exist, why they’re worth using, and when you can skip them. Plus how to reduce boilerplate.